This story was updated at 4:46 p.m. EDT. NASA?slong-distance effort to revive the ailing Hubble Space Telescope is going well,with the orbital observatory on track to resume science observations by week?send, agency officials said Thursday. The two-dayrepair began early Wednesday as NASA engineers began commanding Hubble fromthe ground to switch to a backup system after its main data relay channelfailed last month. But remote control fix is tricky, requiring systems to powerup after nearly two decades of hibernation. ?Everythingis going fine,? said Susan Hendrix, a spokesperson at NASA?s Goddard SpaceCenter in Greenbelt, Md., where Hubbleoperations are based. ?Everything is going according to plan.? Hubble?s mainscience operations were silenced on Sept. 27, when the Side A channel of its ScienceInstrument Control and Data Handling system failed after 18 years of continuous servicesince the space telescope launched in April 1990. The malfunction prevented theotherwise healthy Hubble from sending home the bulk of its science observations, including the trademarkviews of space that have given the telescope its iconic status. Hubble hasa backup data relay channel, Side B, but the unit and five related systems hadnot been powered up since the space telescope reached orbit. After weeks ofanalysis, NASA engineers were confident the backup system could be activatedand began the days-long process yesterday morning. ?I wouldn?tsay it?s a dicey thing,? said Art Whipple, chief of NASA's Hubble systemsmanagement office at Goddard, on Tuesday. ?It is a complicated procedure and itis one we have not done before.? If all continuesto go well, Hubble could resume beaming home science observations by middayFriday, Hendricks added. ?The teamworked well into the wee hours to accomplish what they did yesterday,? Hendrixtold SPACE.com. ?The science instruments are going to take some internalexposures today and start calibrating.? 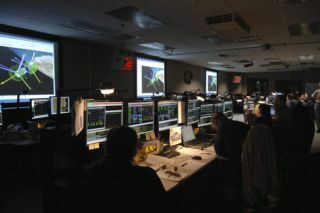 Thecalibration activities are expected to be performed before midnight tonight,NASA officials said. Hubble?srecent glitch prompted NASA to delay the planned Oct. 14 launch of the shuttleAtlantis and seven astronauts to the orbital observatory for a finalservice call. That mission has been pushed to February 2009, with engineershoping to send a spare data formatter to restore redundancy after the Side Afailure.